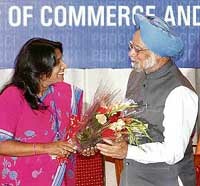 Ludhiana page: PM’s visit—an exercise in futility? The chief ministers and senior ministers of Delhi, Himachal Pradesh, Jammu & Kashmir, Punjab and Haryana did not let go any opportunity to have dig at each other on sensitive inter-state disputes at the Chief Ministers' Conclave organised by the PHD Chamber of Commerce and Industry here today. 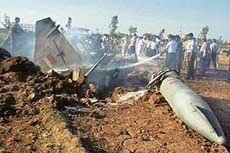 A fighter aircraft, MiG-29, of the IAF crashed in Ambala late this afternoon. There were no casualties. The fighter aircraft crashed within minutes after take-off from the Ambala airbase. In a partial climbdown following criticism from all quarters, particularly by farmers in the state, the Punjab Chief Minister, Capt Amarinder Singh, today declared that “not even a single kanal” of farmland would be acquired by his government for the special economic zones (SEZ) being set up by various private players. India is not worried on whether the India-US Civilian Nuclear Cooperation Bill will be passed by the Senate or not, but its immediate concern is when will the voting take place. Asking President Pervez Musharraf to stick to his commitment to end cross-border terrorism, India said today that Pakistan should dismantle terror outfits on its eastern border just as it was doing on its western border with Afghanistan. We cannot change our neighbours. And if you have to live together, it is better we live in peace. Trust begets trust. The Kerala High Court today directed Dr Jasleen Virk, daughter of Punjab DGP S.S. Virk, to appear in person before it tomorrow to amicably settle the marital dispute with her husband Vikramjit Singh, an IPS officer in the state. The special court constituted under the Terrorist and Disruptive Activities Act (TADA) today acquitted five persons charged with conspiracy in the 1993 serial bomb blasts case. One person was, however, found guilty. Pakistan captain Inzamam-ul Haq was today cleared of the ball-tampering charge but banned for four one-day internationals for bringing the game into disrepute. 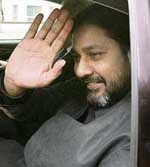 Inzamam-ul-Haq waves to the crowd as he leaves the Oval cricket ground in London on Thursday.